Early one morning while in San Francisco Katie and I headed to the Aquarium of the Bay at Pier 39. We purchased two tickets and to make our experience even better we decided to take a behind the scenes tour for an extra $9.00. It was worth every penny. 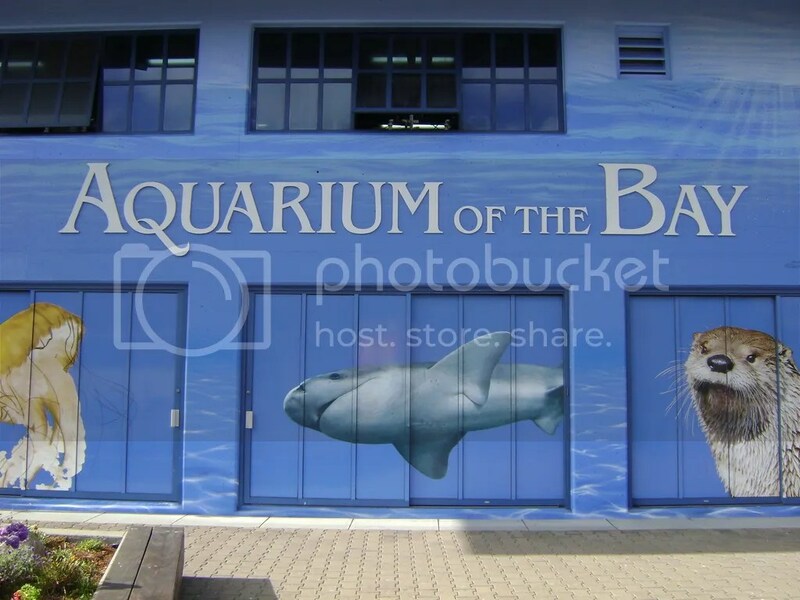 Aquarium of the Bay has been around for over 15 years. It works to protect, restore and inspire the conservation of San Francisco Bay and its watershed. 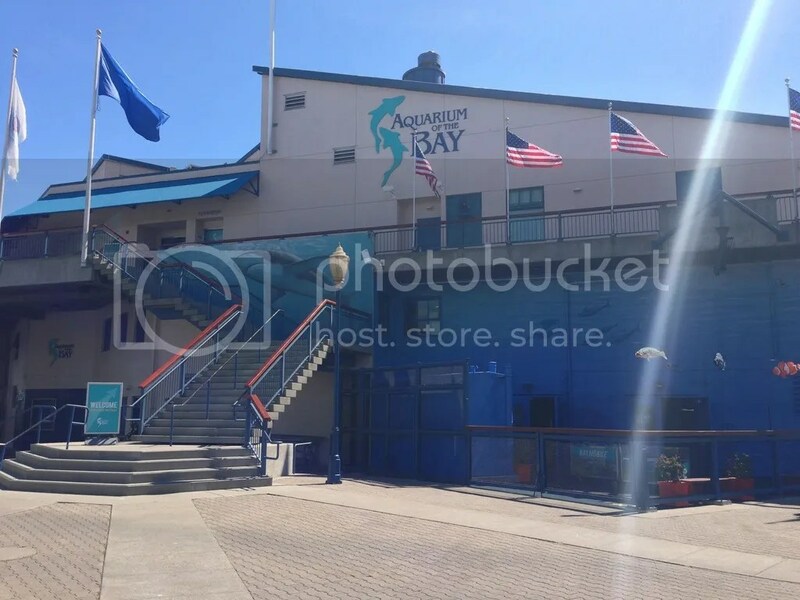 It is a nonprofit marine nature center affiliated with The Bay Institute. With it’s “Conservation Impact Programs” it reaches out to the local community working with partners to provide research on local shark populations, bring back native salmon, assist chefs, restaurants and consumers in selecting “Sustainable Seafood,” remove invasive species from marine and estuary environments, support endangered species, combat climate-induced sea level rise, enact policies that will create healthy fresh water flows back to San Francisco Bay, and create a series of original and ready-made temporary exhibitions that explore local and global environmental challenges. 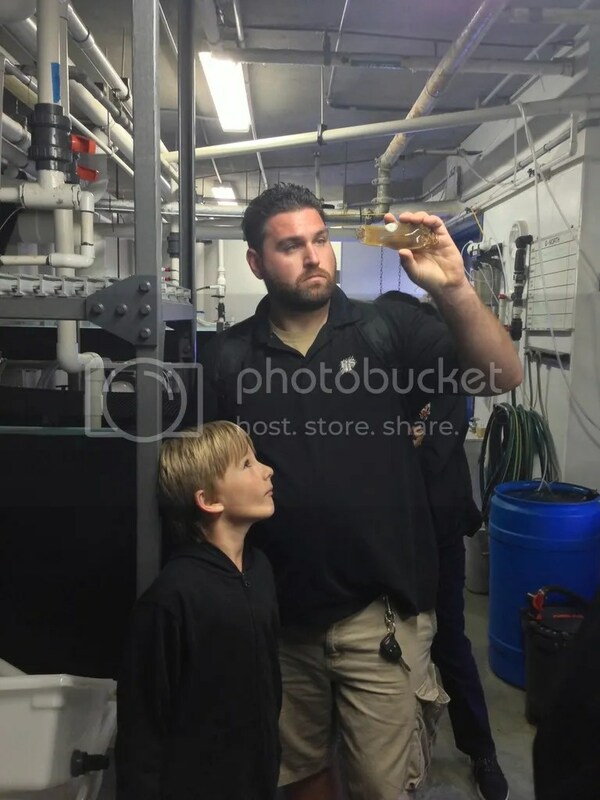 Excitement filled my body as we walked into the aquarium and explored the first part of the top level looking at fish in small tanks and learning a little bit about those fish and the water in the bay. The bay is part salt and part fresh water and all kinds of fish can be found there including sharks. We took a moment to stop for a picture and then headed down under the ground to their aquarium tunnels, the real draw of the aquarium. Arriving at the lower level it was very dark. Immediately after stepping out of the elevator we could see jellyfish in front of us. 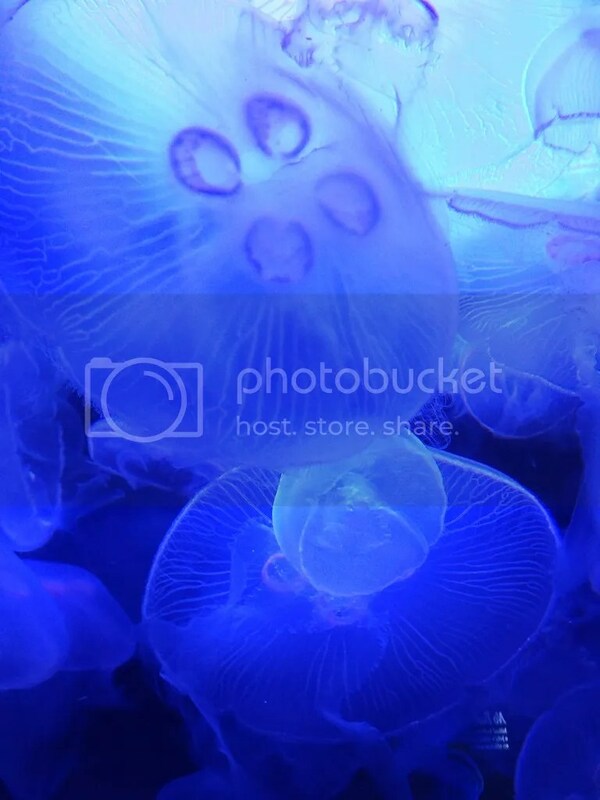 We took a right into the room and saw even more including the most popular, moon jellies. They flowed with the currents sent through their private tanks and gently glided around and around. 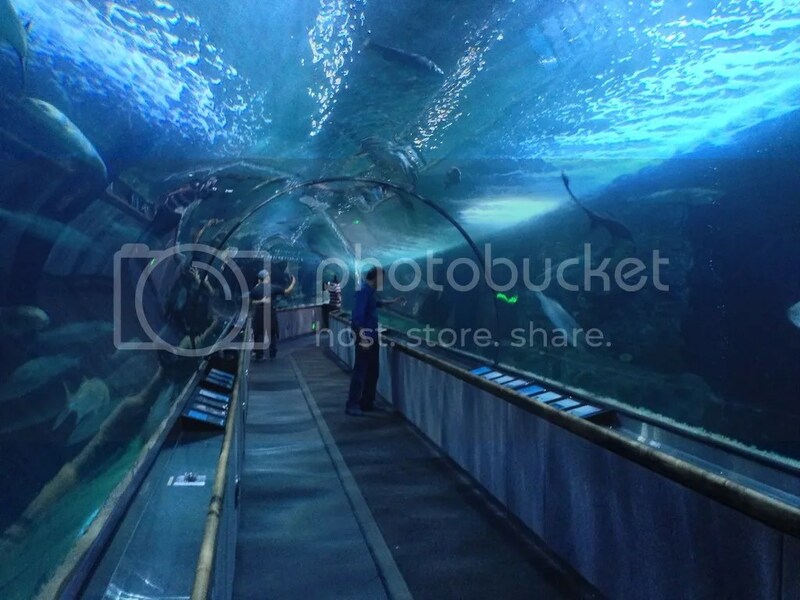 We then headed to the huge tank with two long tunnels where 300 feet of crystal clear acrylic allow you to watch the fish swim around the tunnels above and to the sides. 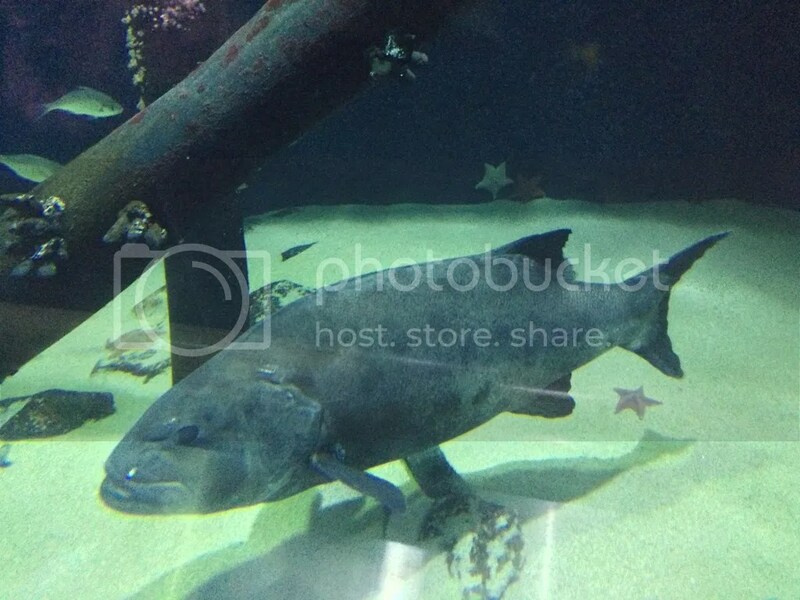 This tank holds 700,000 gallons of carefully maintained bay water. 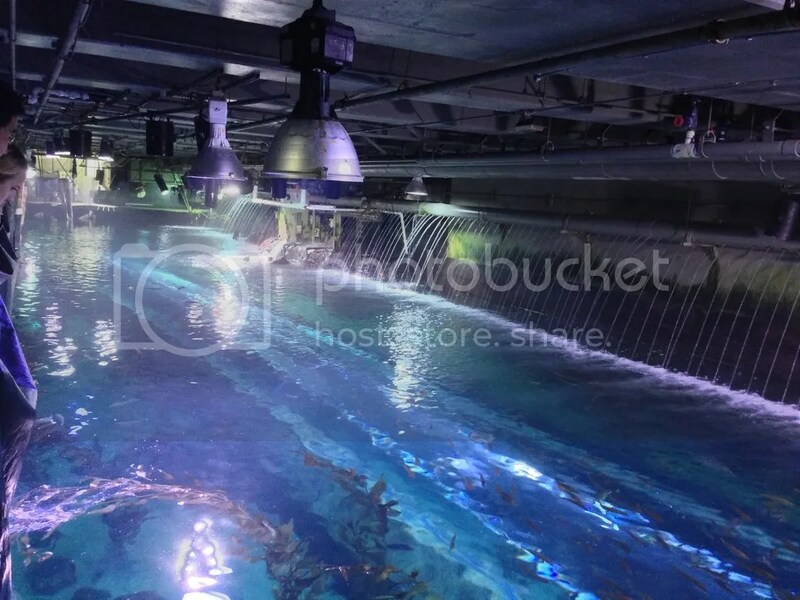 Light from above the tanks peers down through the water and on you in the tunnels allowing you to see where you are going and view all different kinds of fish. Approximately 30,000 animals live here including bass, white sturgeon, sevengill sharks, and California sheephead. 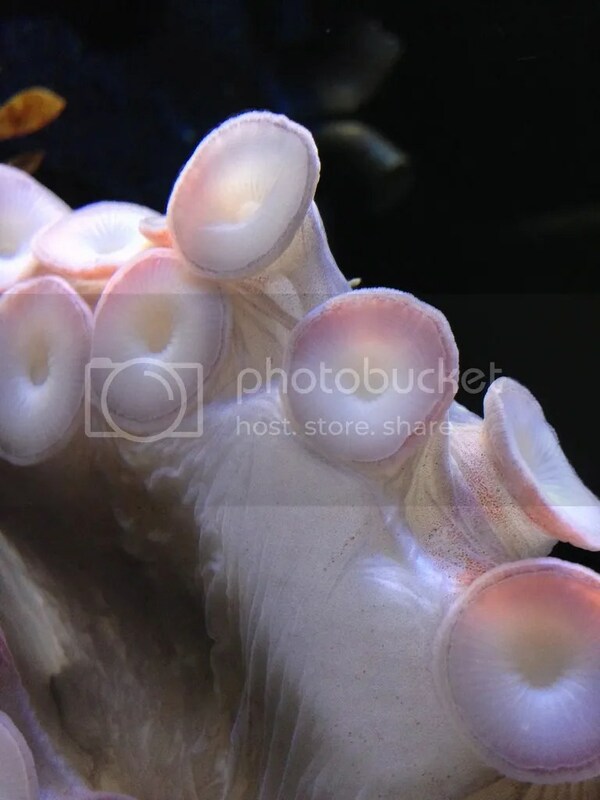 At the end between the two tunnels there was even an octopus in its own tank. Suctioned toward the top it sat waiting or resting. I took a moment to peek my head inside the dome cut out to get a better look. Then we headed through the second tunnel. We got back to the elevator and went up to the “Splash Pools” also known as the touch pools. We took a few minutes to pet the starfish, sea cucumbers, anemones, and baby bat rays and baby skates as they swam around the pool. Then there was a short feeding where the employee asked everyone to keep their hands out of the pool for the next 30 minutes. She told us about the sharks in the pool which were resting on the far edge toward the center of the pool because they are nocturnal and were sleeping the afternoon away. She also spoke a little about the different animal’s feeding techniques. 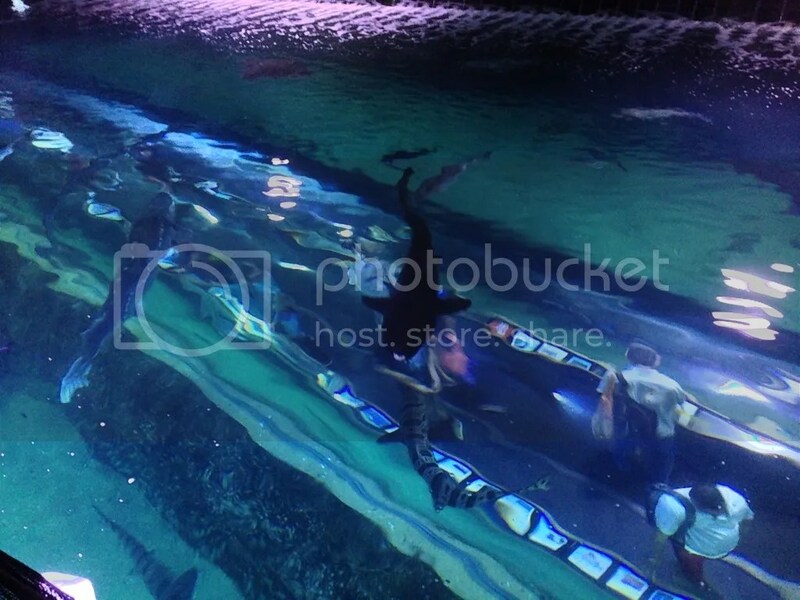 She eventually tossed food in so the bat rays and skates could eat. 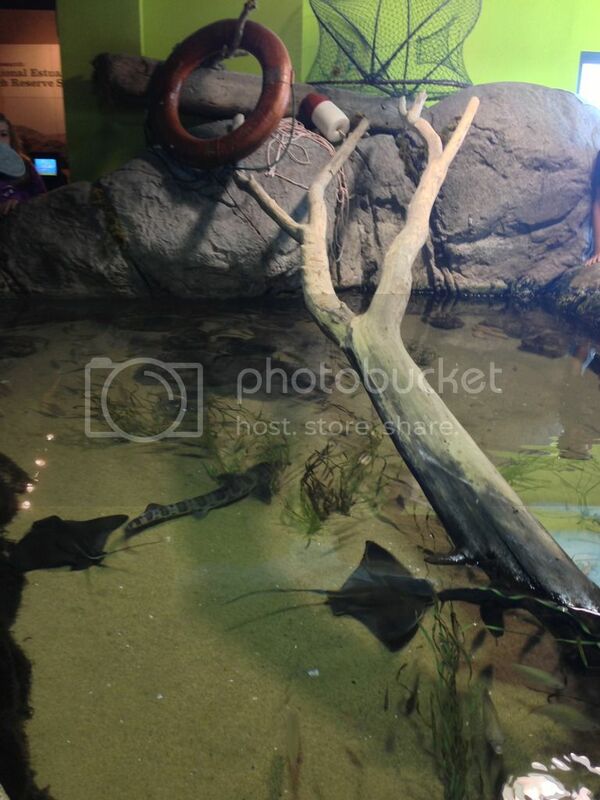 The bat rays vacuumed the food up while the skates swam over it and ground it up with their teeth. It was fun to watch. 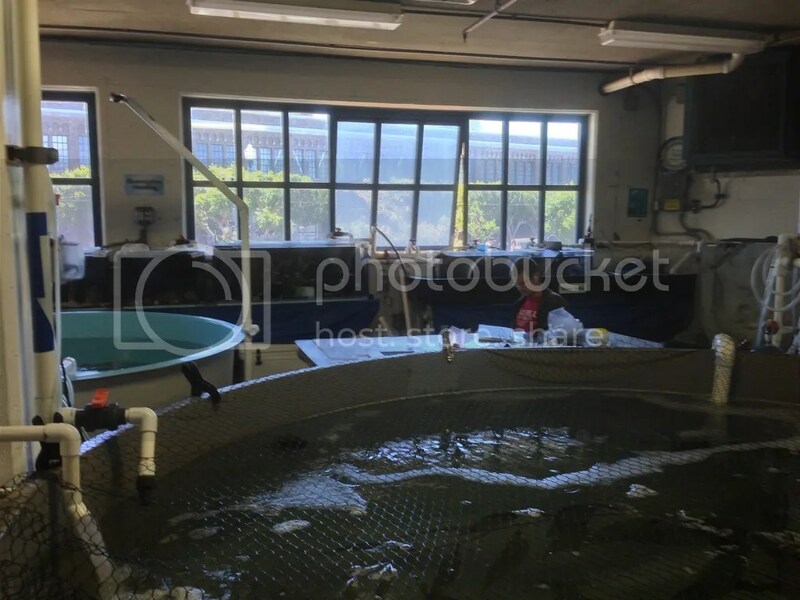 The school of fish in the center of the pool often reached the pieces first being attracted to the splash while the skates and rays took a little longer to find the pieces as they were attracted by the smells and waited for the food to settle on the ground. It was finally time for our Behind-the-Scenes tour and this is where things started to get even more interesting. We headed to the front desk to meet up with our tour guide. It was just us, a family of three and about 4 people about to become employees. We walked through some doors that read “Employees Only” and made our way to our first stop, the main water filtration machines. Our guide told us about how most of the water in the aquarium is from the Bay. She showed us a sample of the water before it’s sent through the filtration center. The murky water is actually very healthy. 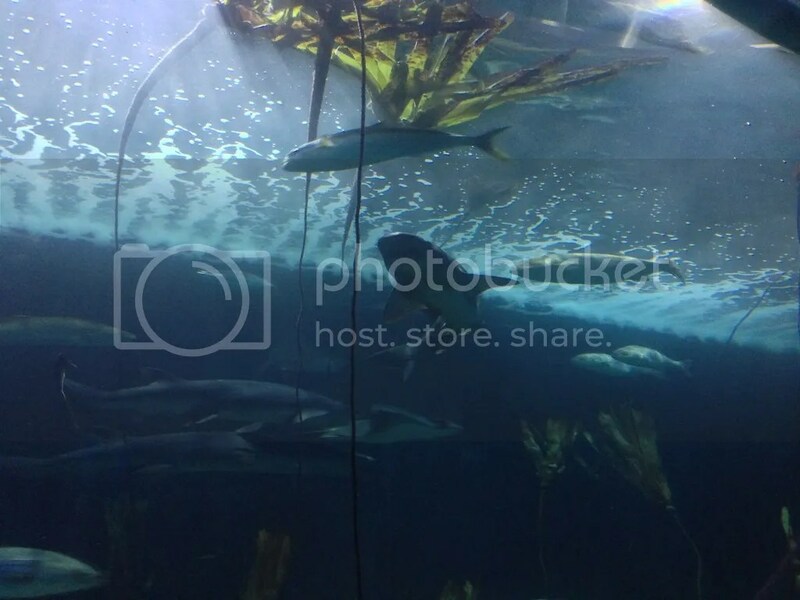 They really only filter it because if they didn’t no one that visits the aquarium would be able to see the animals. The water is filtered through their system constantly for some of their tanks while others it’s filtered less frequently. 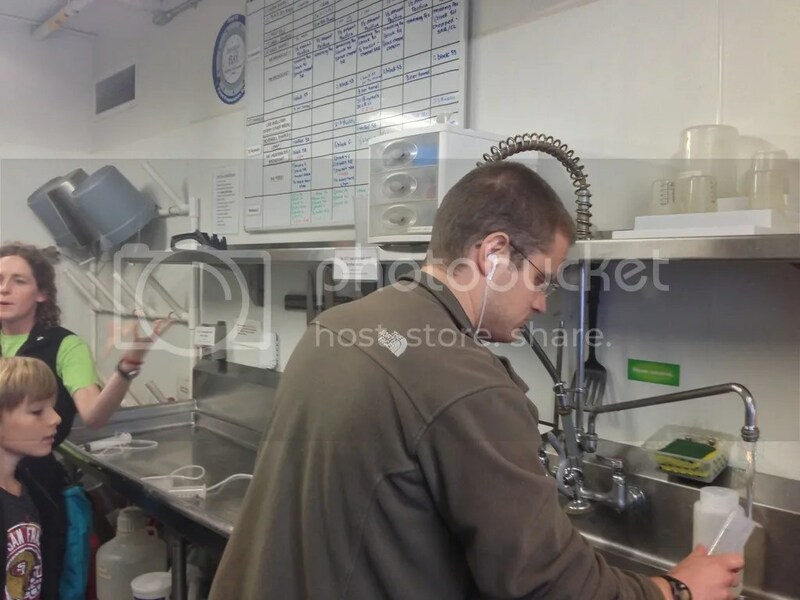 Next on our stop was the kitchen where they prepare all the food for the animals. 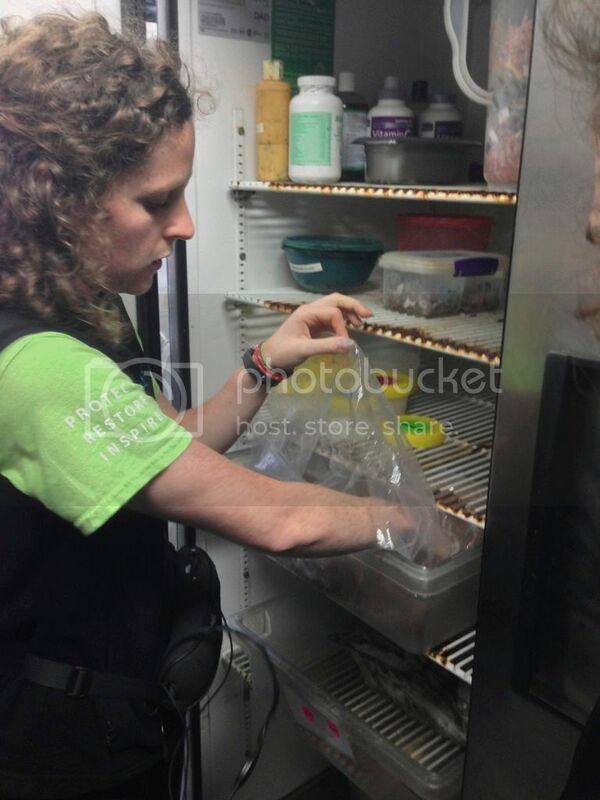 They have two big refrigerators and a walk in freezer containing fish, mice, squid, shrimp and more. Everything they need to feed the animals that live there. On a wall above the sinks is a big feeding chart that divides the animals by sections as to when they should be fed and how much. Some animals have special needs, such as Lenny one of their five white sturgeon who is missing his whiskers. 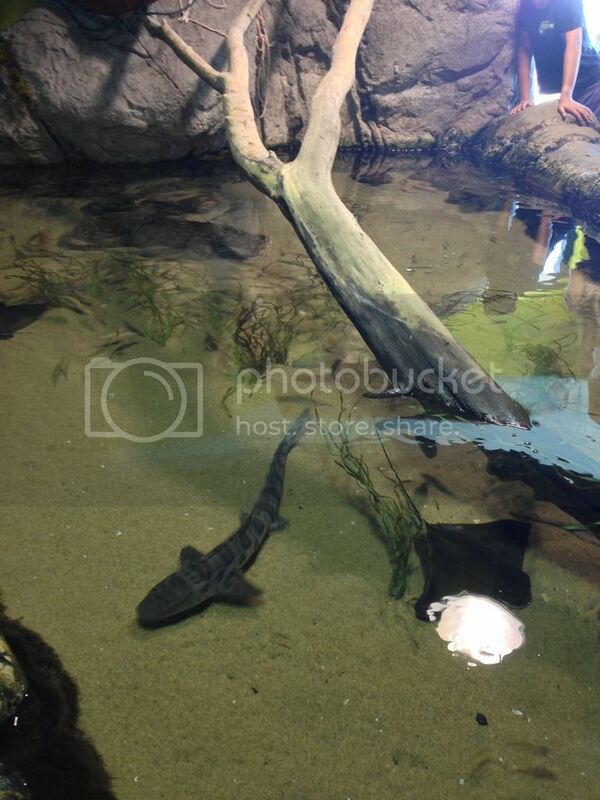 Since whiskers are vital in food finding for a sturgeon they have taught him to target a big stick. Using that stick they are able to help him locate his food through a hole in the target. 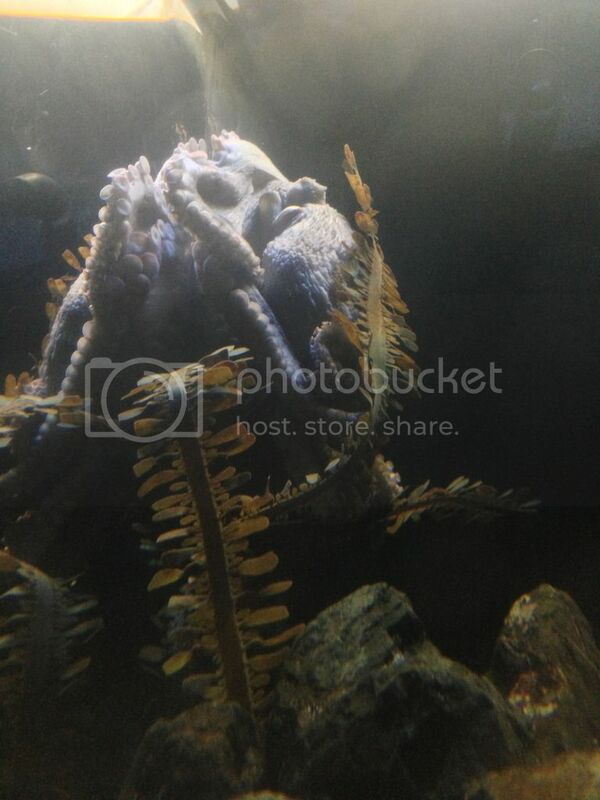 Later we were able to see the tank and stick that they use during his feeding process. Too bad we weren’t there on the day Lenny gets fed. I would have loved to see that. 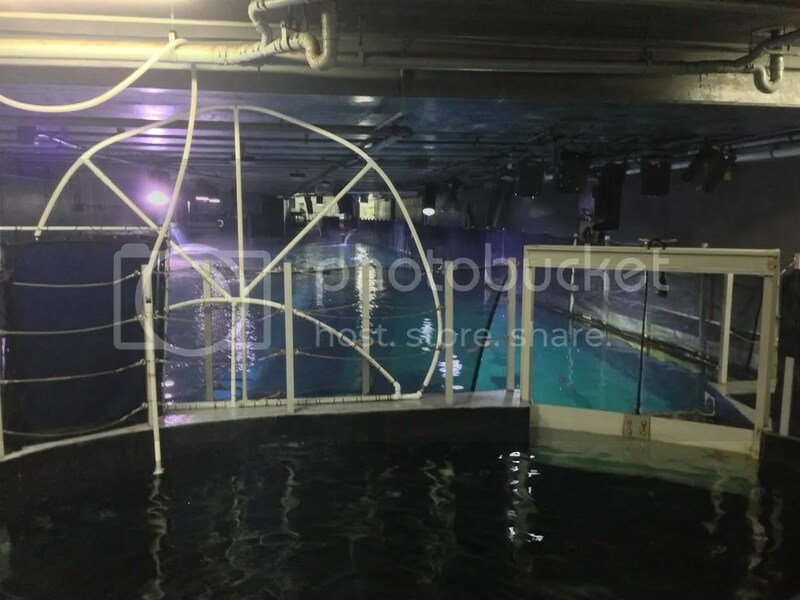 We went upstairs to the holding pools where they hold animals before they put them into the big tank. 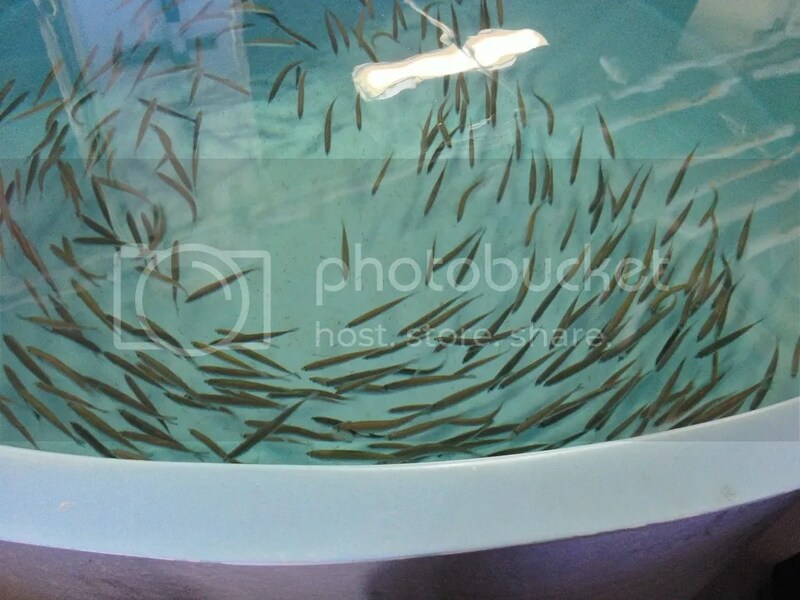 Sometimes baby shark or skates live there until they are big enough to join the rest of the animals. 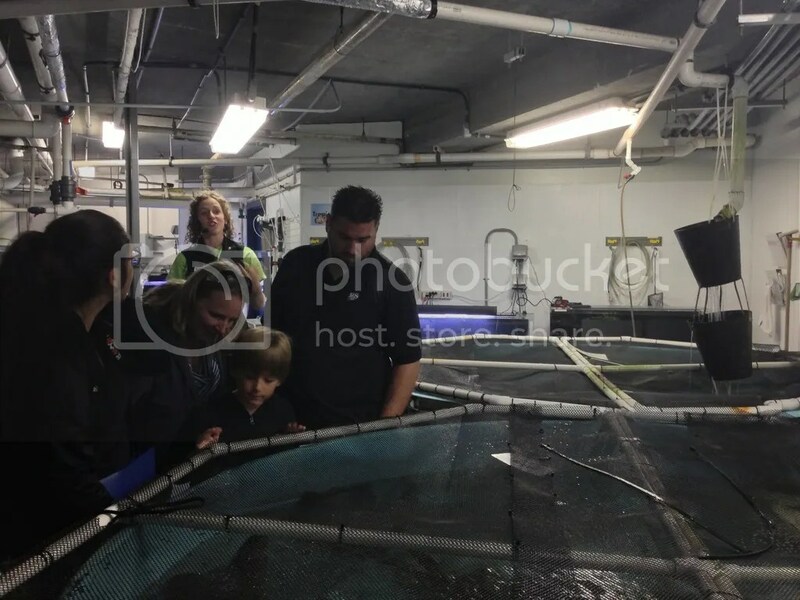 The day we went there were some wolf eels which rarely come out of their hiding places so it was lucky that we were able to seem their full body in the holding tank. 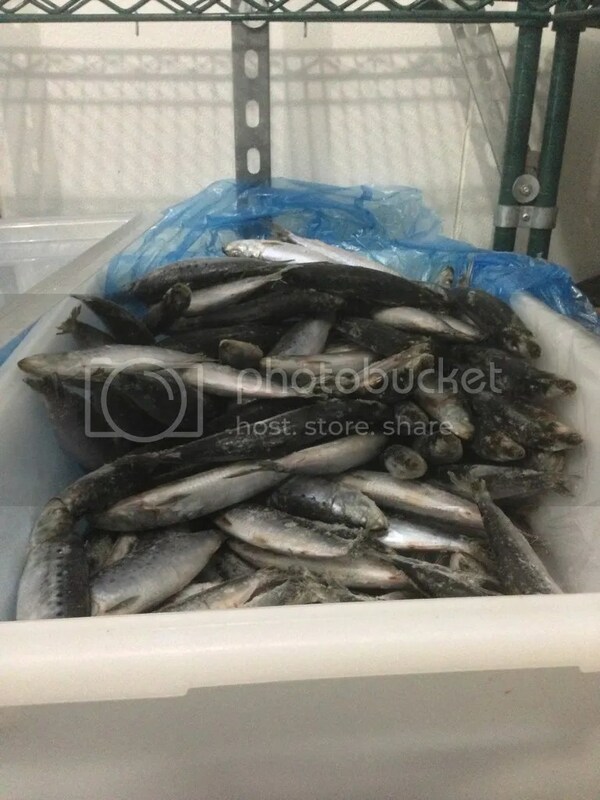 Also some herring were in another tank that one employee was doing some studies on. He was trying to find out if fish can smell plastic in the water. He told us that this would be very helpful to know because there is so much plastic in the water and often the fish have bits in their stomachs that it makes its way up the food chain to us. 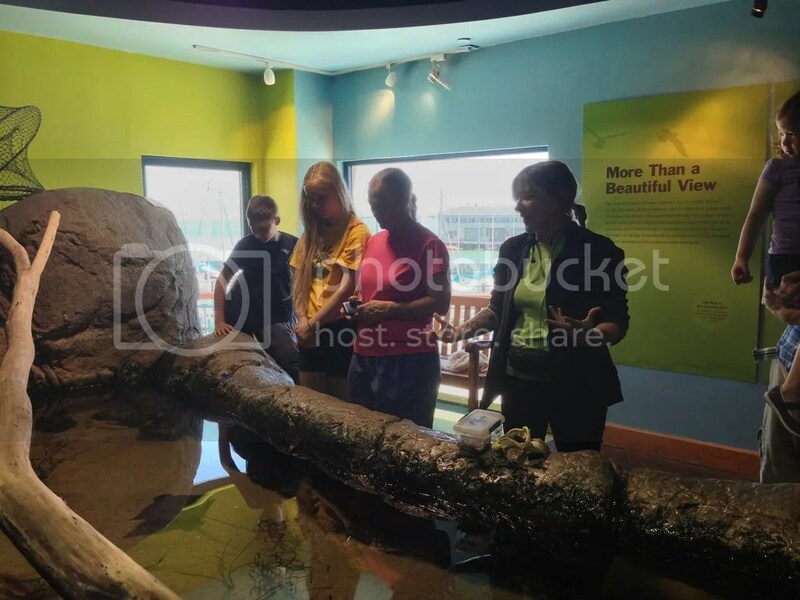 We moved onto the huge 700,000 gallon tank, but just before getting to see it we stopped at a smaller holding tank attached to it near the front of the room. 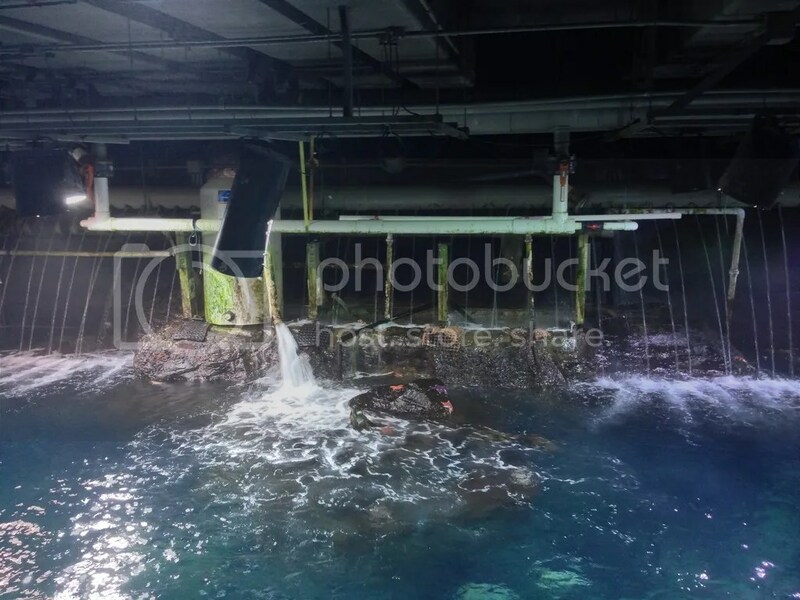 This is where they would place fish in to acclimate them to the water before releasing them into the bigger tanks. 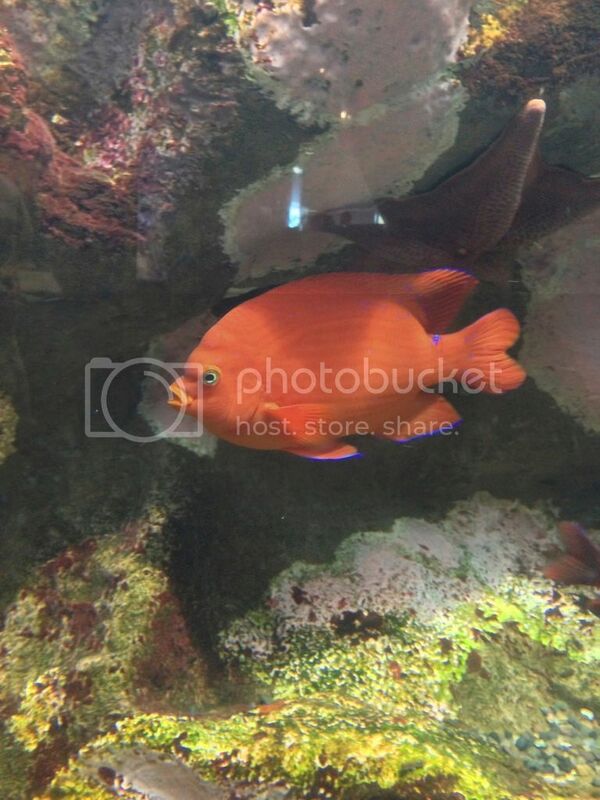 This is also the same tank that they taught Lenny and the sharks to swim into to be fed. There was a school of herring in there the day we went. We finally got a full look at the main pool from above. It was huge and quite breath-taking. The water was bright blue and crystal clear. You could see all the way to the bottom without a problem. The fish looked even bigger than they did from down below as we could see them occasionally cut through the surface of the water in the pool. Water was constantly being fed into the pool in what looked like mini waterfalls all along the edges. There was even a section I would like to call starfish island where multiple starfish had made their home just at the water’s edge. We walked over the metal track that ran through the center of the tank taking it all in, careful not to drop anything in. With the slits in the ground under our feet and the open railings, our tour guide told us that if we drop anything in we won’t be getting it back until the scuba divers went in the following day. I held my camera tight every time I pulled it out of my pocket. As we reached the other side our tour guide showed us some more holding tanks. These were filled with baby sharks and bat rays. She also showed us the pods that the sharks and rays lay to make more babies. These can often be found empty along the beaches. As we held them up to the light we could see that there was definitely something in there. 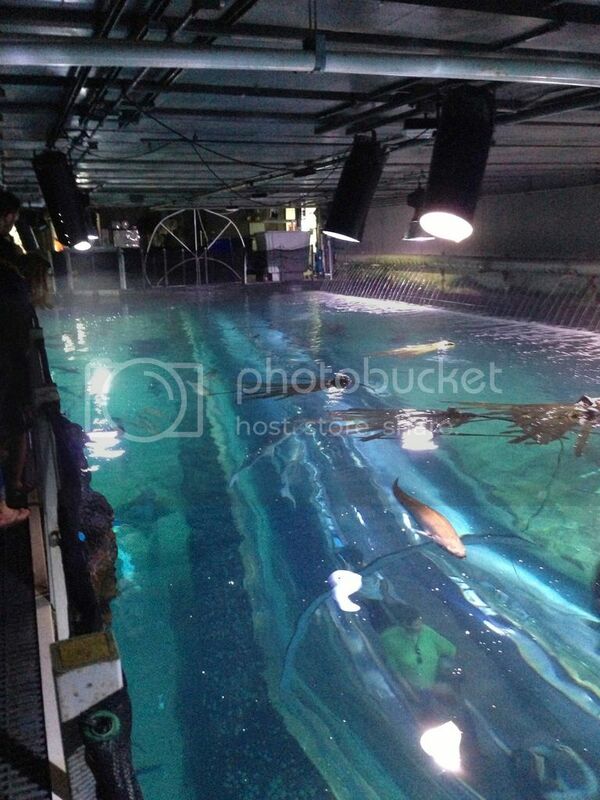 We headed back across the huge tank again and back to the holding tank attached to it. As our tour ended we made our way to our last stop, the medical room. There wasn’t much to see here as there was no vet on site that day because all the animals were doing well. Our tour guide told us a little about the lice and other parasites that live on the animals in the bay and how they try to make sure none of their animals catch them by isolating the new animals before they introduce them to the full population. 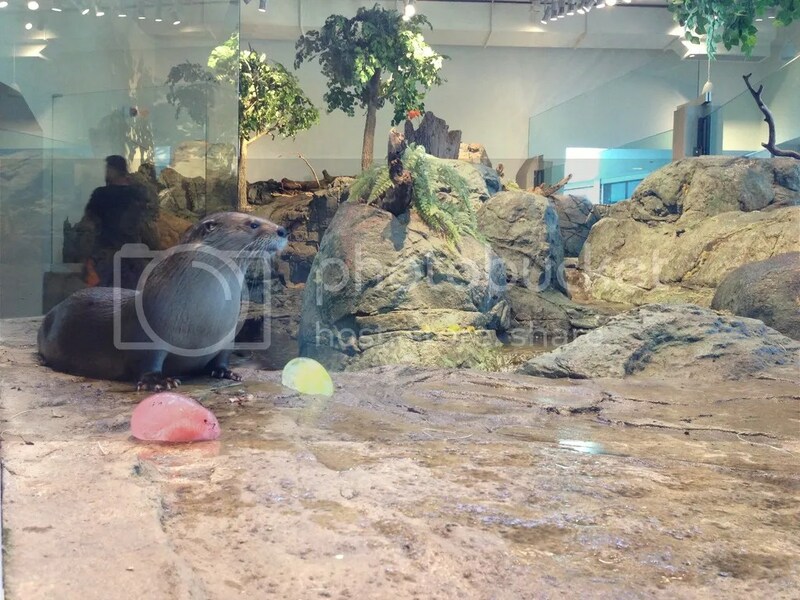 She brought us back up the stairs and out to the main entrance of the aquarium, reminding us that in about 10 minutes the otters would have having their two year Anniversary Celebration. 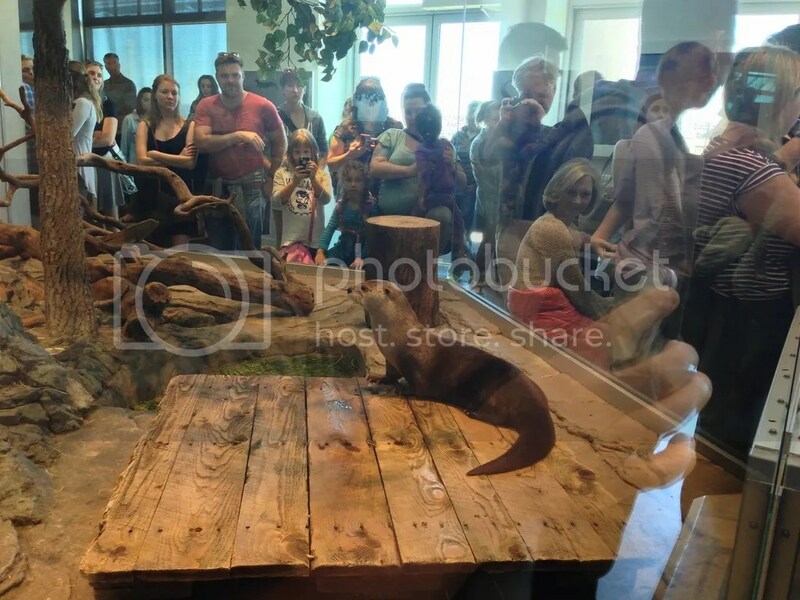 We waited patiently for the event to start as the three otters rested in a high perch at the back of the exhibit. As the commotion around them grew it peeked two of their interest. They started to move around the exhibit in anticipation of the big occasion. 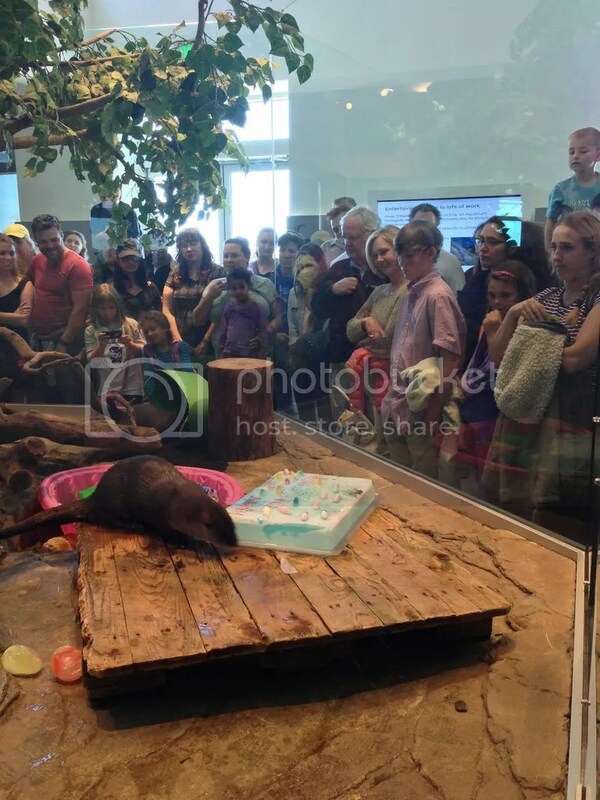 The employees and volunteers finally made their way over to the otter exhibit with a ton of interactive toys from kongs and buckets of dirt to frozen fruit and fish layered cakes. 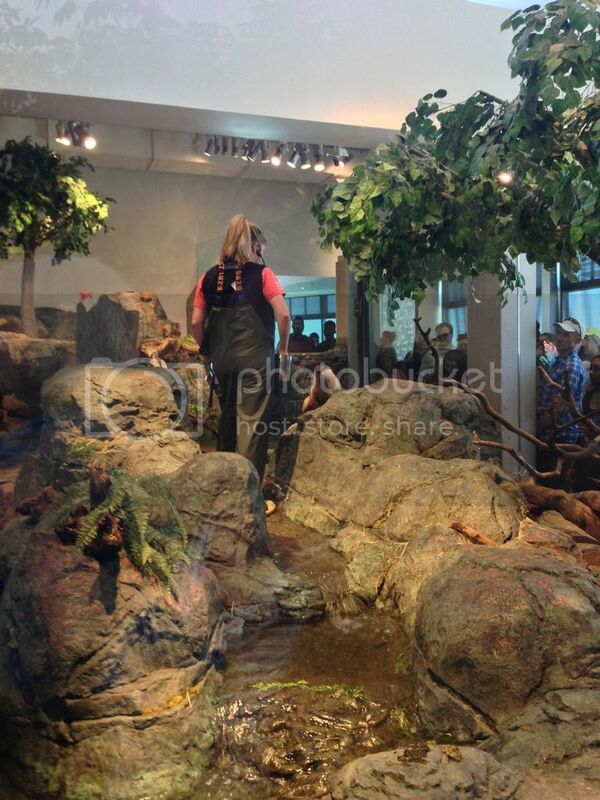 The trainer stepped inside and kept the otters focused on her as the volunteers moved the toys into their exhibit. While one of the otters loves food and was completely focused on the trainer, the other two were very interested in what was going on behind her. They were able to get the stuff in and them out without incidents or loose otters. The trainer spoke about what they were doing and each of their personalities as we all watched them explore, play and eat their new way through a huge cake and all their new toys. 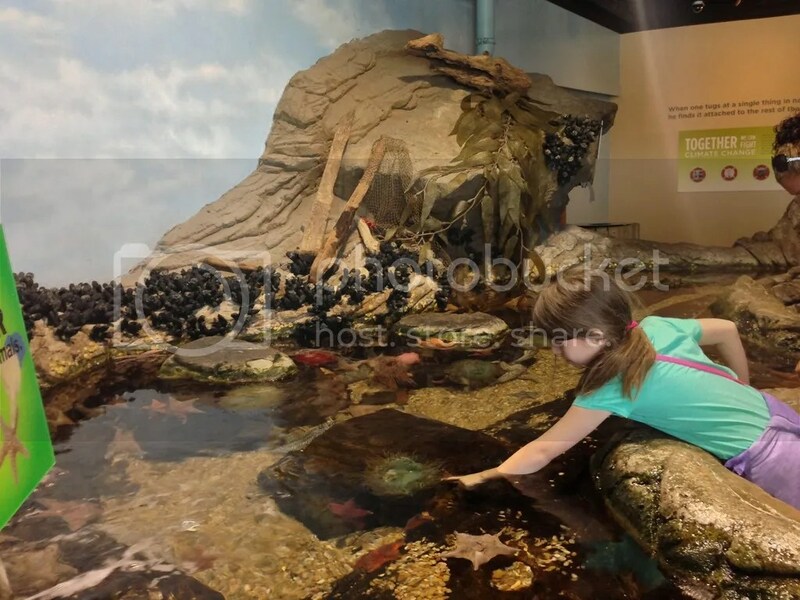 Aquarium of the Bay is a great place to spend a few hours or a whole day. It’s great for all ages and for anyone that wants to learn about marine wildlife. There’s a ton to experience and explore throughout the whole place. And if you’re lucky and you go on just the right day you can have an entire experience full of surprise anniversaries too!